The improvement of HOLODECK technology aboard Starfleet vessels during the 2360`s and 2370`s has become a useful tool in the evolution of Commander Data, Starfleets only android . Like his colleagues, Data uses the Holodecks for a wide variety of purposes, he has also used the facility in his efforts to understand humanity. Data becomes interested in the recreational and educational potential of the Holodeck when on Stardate 41997, when he joins Captain Picard, Dr Crusher,and MR WHALEN, the ships historian, in, THE BIG GOODBYE, on of Picards favourite DIXON HILL holo adventures. Despite initial problems, the adventure encoureges Data to explore the Holodeck for himself. One way in which Data has gone about this is to use the Holodeck to recreate Shakespearean dramas in the hope that through acting in these plays, he will come to appreciate the emotions that drive human beings. Two roles that are favoured by the android are PROSPERO from Shakespears "THE TEMPEST" and HENRY V in the play of the same name. Captain Picard is often present as an observer and advisor in Data`s Shakespearean explorations, the Captain helps Data to a better understanding of the roles and, therefore, of human behavior. Data`s dramatic recreations on the Holodeck have not only been confined to the works of Shakespeare. he has also played the part of EBENEEZER SCROOGE the main character of CHARLES DICKENS "A CHRISTMAS CAROL", among others. Data has also been known to use the Holodecks for purely recreational purposes. 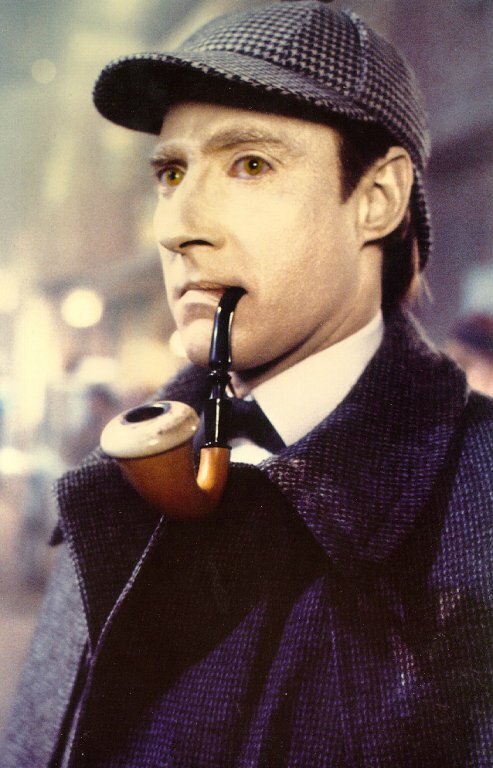 One of his favourite holographic simulations is a recreation of the adventures of Sir ARTHUR CONAN DOYLE`S literary sleuth, SHERLOCK HOLMES.with Data in the role of Holmes, and Chief Engineer Geordi LaForge filling in for Holmes`s compainion DR WATSON, the teo often set out to solve the mysteries of 19th century London. But not all of Data`s recreational outings on the Holodeck have the adventurous charactersitics of his Sherlock Holmes programmes. Data`s weekly poker games with the senior officers of the Enterprise leads him to create a Holographic simulation of a poker game with three other players that can match their wits against his superior intillect. The three holographic geniuses, SIR ISAAC NEWTON, ALBERT EINSTEIN, AND STEPHEN HAWKING are considerable opponents for Data, and provide him with intellectual stimulation as well as a good poker game. The aspect of human behavior that gives Data the most trouble is the concept of humour. In an effort to learn more about this complex behavior, Data uses the Holodeck to simulate a recreation of a 20th century comedy club named CHARNOCKS COMEDY CABARET. here, he attempts to learn from a holographic stand-up comedian, but this ulitimately proves to be of no use to his further understanding, Data soon realizes nthat the holographic audience only laugh because they are programmed to do so. In 2370 Data begins experiencing nightmares due to an unknown infestation of INTERPHASIC PARASITES. In order to understand these unsettling dreams, he uses the holodeck to recreate a simulation of the father of psychanalysis DR SIGMUND FREUD. Through Freud`s dream analysis, Data eventually realises that outside factors are causing his nightmares, and their influence is soon eradicated. Data`a ability to assimilate data quickly makes the Holodeck an ideal learning environment. When he is invited to the wedding of Keioko Ishikawa and Miles O`Brien, he is conccerned that he have to dance at the reception and asks Dr Crusher to help him how. Together they use a holographic simulation PROGRAM CRUSHER 4, a recreation of a dance studio, complete with holographic dance partners, to facilitate Data`s dance education.He proves to be an able, and quickly learns several advanced steps. Whether Data`s main aim is recreation, education or exploration, it seems that he is capable of getting as much pleasure out of the Holodeck than any of his orgainc crewmates.